A free decoy bell box, for back of property. 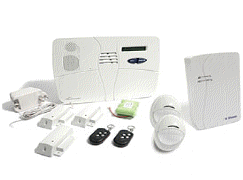 We can provide a hard wired alarm system, from as little as £189.00, with full pet immunity, just click on our wired alarms page. Security lighting can be a big contribution to any security system, it can also be a great asset to the client who has the problem of venturing out into badly lit sections of their property. It will also reduce intrusion because intruder's don't like to be seen, especially in the dark. Security lighting will also help to produce clear vision on CCTV systems. The concept of having an open door policy for all is often thought to invite the wrong type of attention. we can provide a range of door access and intercoms, from a single one way system to a complex digital access control system. you can have audio only or full video with audio, wether it be a small flat to a large office or house. When your burglar alarm goes off the reality is that in most situations it is ignored. Many people view the alarm siren as a nuisance and do not call the police or bother to investigate. 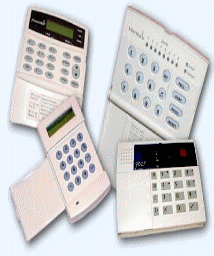 A speech dialer is the ideal companion for virtually any alarm control panel as it provides additional protection, rather than relying on the outside bell to attract attention. MONITORING ALARM SYSTEMS OVER THE PHONE NETWORK. The Voice Dialer is connected between the alarm control panel and the telephone line. It behaves like another extension to the telephone and does not affect the normal operation or that of any other extensions fitted. The Voice Dialer is simple to operate with clear on screen instructions guiding the user through programming messages and telephone numbers. Recording a message is easy as the has a built in microphone and speaker so that phrases can be recorded and replayed directly into the unit. When the outgoing call is answered the Voice Dialer plays a common phrase which normally states your name and address and one of the phrases relating to the inputs from the control panel (PA, burglary, fire and fluid ). SIM card with all orders and £10 Credit to get you started. 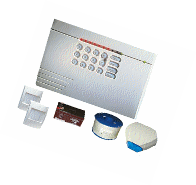 The GSM dialer can be used with any security alarm, CCTV system, door entry system or fire alarm for remote monitoring over the any standard mobile phone network. The GSM alarm auto-dialer can be set with customized messages depending on the terminals used to send alarm activation text messages to various users. 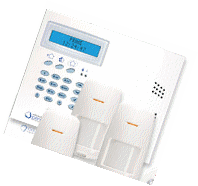 for your burglar alarm system from,Texecom, Pyronix, Rokonet, Scantronic, ADE and C&K Systems. Burglar alarm passive infra red PIR detectors are an important part of any burglar alarm system. The correct PIR detector should be chosen with care to get the best out of your burglar alarm system. Detects motion by sensing the body heat of a person moving across its field of view. A series of lenses on the cover guide the PIR's view, which is fixed in one direction. This technology has been fine tuned so that false alarms are minimal these days. These use two different technologies in the same unit, usually passive infrared plus microwave. These devices are designed to avoid false alarms since both technologies must detect motion before setting off the alarm. you would use this type of PIR detector in conservatories, garages and places were the temperature would change considerably quick, or a place prone to draft. We will give you pet friendly detectors without any further cost, if you request when ordering your system or upgrade. Please note we have many other detectors in the PIR range, such as ceiling PIR detectors and curtain PIR detectors. Our Vibration / Shock sensor can be used to protect doors, windows, walls, safes etc. it is also suitable to be used in caravans, boats and numerous other structures prone to attack or vandalism. The sensors are available in white for use with uPVC windows and in brown for use with hardwood windows. This is to ensure that the sensor is as unobtrusive as possible. A single push panic attack button is a fantastic addition for any intruder alarm system. we have many types (Brand & Style May Vary). We have watch and neckless panic buttons as well as metal and corm types, all the panic buttons work on a 24 Hr circuit, which will cause an alarm to activate when pressed, even if the alarm is not set. This Detector uses microprocessor-based sound analysis technology (SAT) to listen for the specific frequencies associated with breaking glass. It can be used to detect breakage of plate, tempered, laminated and wired glass types. A built-in environmental test feature alerts the installer of false alarm hazards in harsh environments. It is specially designed to mount on door or window frames. A built in magnetic contact allows monitoring of a door ow window opening. Smoke, Heat and Carbon Monoxide alarms. In properties where there is a requirement to connect Smoke, Heat and Carbon Monoxide alarms to a low voltage security system and, in particular, where budget is the key, these 12V DC Smoke, Heat and Carbon Monoxide alarms from ABBA, are ideal for connection to domestic security systems. PLEASE NOTE THAT THEASE UNITS ARE AN ADDITION TO YOUR SYSTEM AND ARE ONLY PERMITTED ON DOMESTIC SYSTEMS. High sensitivity alarm for detecting the leakage of household gas, liquid gas and natural gas. The sensor reacts with the diffused gases in the air directly and generates a linear voltage signal. When the detected gas density reaches a set value, it will trigger the alarm system. The Flood Alert Water Detector is designed to detect a potential water leakage in your home. The Flood Alert can protect your home, business, assets and save yourself a lot of bother.